Google's Project Fi MVNO is taking $200 off a pair of LG handsets. The LG G7 ThinQ is now priced at $549, $200 or 27% less than the previous price of $749. With the price cut, you can own the device for 24 monthly payments of $22.88. Carrying a Super Bright 6.1-inch LCD display with a resolution of 1440 x 3120 (which works out to an aspect ratio of 19.5:9), the phone is powered by the Snapdragon 845 Mobile Platform and is equipped with 4GB of RAM and 64GB of native storage. There is a dual 16MP + 16MP dual camera setup in back (with AI features), and an 8MP front-facing wide angle camera. Keeping the lights on is a 3000mAh battery and Android 8.0 Oreo is pre-installed. The price of the LG V35 ThinQ has been reduced 22%, or $200, from $899 to $699. That comes out to $29.13 a month over 24 months if you're financing the purchase. The LG V35 ThinQ is equipped with a 6-inch OLED panel with a revolution of 1440 x 2880 for an aspect ratio of 18:9. The Snapdragon 845 Mobile Platform drives the handset, which features 6GB of RAM and 64GB of native storage (47.58GB available to the user). The LG V35 ThinQ has a pair of cameras on back (with AI capabilities) including a 16MP primary camera with an aperture of f/1.6. The 16MP wide angle camera has a 107-degree viewing angle, and there is a front-facing 8MP wide-angle camera for selfies and video chats. A 3300mAh battery powers the phone, which has Android 8.0 Oreo pre-installed. Now wait. There is more. Purchasing either phone will give you a $150 service credit to be applied toward your Project Fi wireless plan. You must activate either phone within 30-days after purchase, and you have to be signed up to a full service Project Fi plan (that means voice and data). And you need to have a Project Fi or Google Payments account. Don't try anything cute. If you cancel the purchase or return the phone you buy, the service credit goes away. By the way, it will take 45 to 60 days for the $150 to show up in your account. Project Fi also has the new Google Pixel 3 and Google Pixel 3 XL available to pre-order, if you're interested. We consider Project Fi to be a hybrid carrier since it automatically switches signals between those provided by Wi-Fi hotspots and cell signals provided by Sprint, T-Mobile, U.S. Cellular, and Three. With Bill Protection, a single subscriber pays $10 for each GB of data up to $60. After that dollar amount is reached, data is free for the remainder of the month. 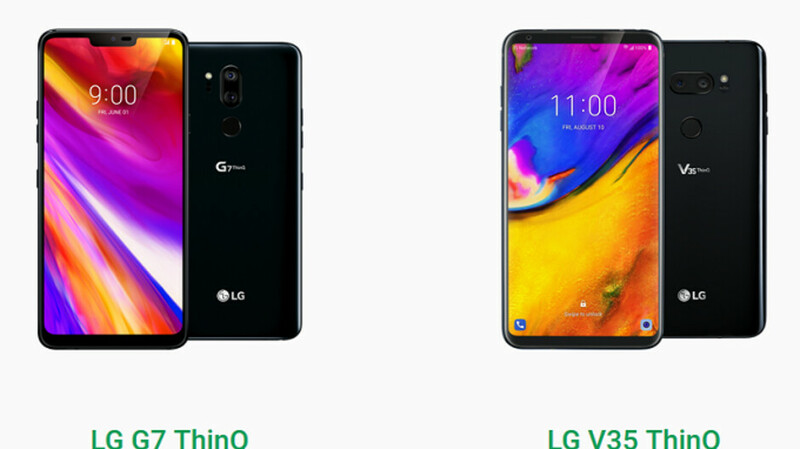 If interested in Project Fi, the LG G7 ThinQ and the LG V35 ThinQ, click on the sourcelink below.